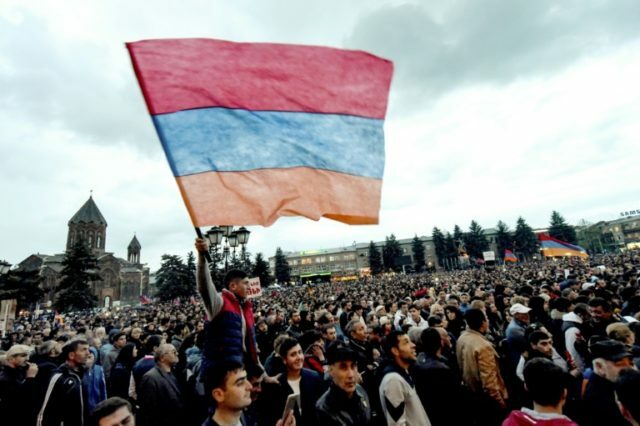 Yerevan (AFP) – Supporters of Armenia’s protest leader Nikol Pashinyan took to the streets Sunday, hoping that a massive show of force will propel the opposition politician to power in a key election two days away. Ex-Soviet Armenia has been in the grip of a severe political crisis for the past two weeks, with the country’s veteran leader Serzh Sarkisian stepping down after a decade in power in the face of major protests. Pashinyan, 42, has thrown down the gauntlet, saying his colleagues in parliament should elect him to succeed Sarkisian in the vote on Tuesday. On Saturday, after days of frantic negotiations, two major parties said they would back Pashinyan, but the opposition lawmaker was still six votes short of the 53 he needs from the 105-seat legislature. He needs the backing of the ruling Republican Party, which has 58 seats, and said it would announce its position on Monday. Eduard Sharmazanov, vice speaker of parliament and the ruling party’s spokesman, has said he personally doubted that Pashinyan was a suitable candidate for the top job. In a bid to break the deadlock and drum up support, Pashinyan called on his supporters to block roads in the capital Yerevan throughout the day on Sunday and to stage a jumbo rally in the evening. “Our fantastic rallies and meetings across the country have affected the situation in a powerful way,” he told supporters in a video address. Earlier this week Pashinyan received a hero’s welcome in a number of towns and villages outside the capital as he drove around the landlocked South Caucasus country with his supporters in a convoy. Sarkisian, who became prime minister on April 17 after serving a decade as president in what was seen by opponents as a power grab, resigned on Monday after 10 days of protests. The opposition has accused him of having failed as president to tackle poverty, corruption and the influence of oligarchs in the country of 2.9 million people. Observers have expressed fears that the turmoil could destabilise the Moscow-allied nation which has been locked in a territorial dispute with Azerbaijan for decades. Moscow has urged compromise and Russian President Vladimir Putin earlier this week spoke by phone with the interim head of government, stressing the importance of the upcoming election.